The mid-term elections in the United States this week have brought an interesting and disturbing, case to the forefront: the so-called “ Central America migrant caravan”. First some history. A group of 160 Hondurans left the city of San Pedro Sula, Honduras on October 12. Their first goal was to reach the Guatemalan border and make their way through. Four days later, around 2,000 people crossed into Guatemala at Esquipulas. From there, the migrants trekked through eastern Guatemala before hitting Guatemala City. Columns of people marched through the capital city, often getting rides from trucks and buses. On October 31, thousands of migrants stormed the Guatemala-Mexico border after Mexican authorities closed the drawbridge. Now, the first batch of migrants have reached Mexico City and are refueling before making the last leg of this lengthy journey. While accurate information is scarce, the Guatemalan NGO Casa del Migrante estimates that over 13,000 people received food and shelter while in Guatemala. Local municipalities set up tents, opened gymnasiums, and allowed migrants to sleep on the streets. The caravan overwhelmed the border town of Tecum Umán in San Marcos. The United Nations estimates that around 10,000 people have crossed into Mexico. Among members of the caravan are women, some pregnant, children, and babies, but there’s no solid data on exact numbers. There have also been deaths, crime, and vandalism reported as the caravan has made its way across Guatemala. One Honduran national died in a traffic incident outside Guatemala City. Authorities presume the individual fell from a moving vehicle. This led the authorities to urge Guatemalan citizens to not give rides to migrants. Now that the first group of this caravan has reached Mexico City, the United States has a hot potato on their hands. The Trump administration has amassed border patrol and national guard to welcome the migrants along the US-Mexico border in Texas. A humanitarian crisis is likely to ensue. There are eerie similarities to the refugee crisis that struck Europe a couple of years ago. But what are the underlying issues motivating people to pack up and walk thousands of miles to the United States? Many of the migrants interviewed have said they are fleeing from poverty, violence and even persecution. Others have stated they are looking for a new life in the United States or looking to reunite with long-lost relatives. The United States has funneled billions of dollars into Central America through cooperation spearheaded by USAID, besides cooperation in military, security, justice, economic, rural development, and humanitarian areas. The Obama Administration targeted the Northern Triangle (Guatemala, Honduras, and El Salvador) in the aid package called the Alliance for Prosperity. In exchange for US aid money, the Guatemala, Honduran, and Salvadoran governments needed to provide evidence of improvement in areas such as health, poverty reduction, and rule of law, to name a few. The aim was to ensure living conditions in Central America would improve in such a way it would discourage people from immigrating illegally. But the Trump administration has announced cuts to this aid package. Sanctions are sure to follow. A region rampant with street violence, organized crime, transnational drug rings, and corruption is a clear breeding ground for this social phenomenon. These issues would motivate plenty of folks to pack up and leave. Still, the exponential growth of the caravan, from 160 to 10,000 people, may suggest that those who joined along the way might have been recruited to do so. 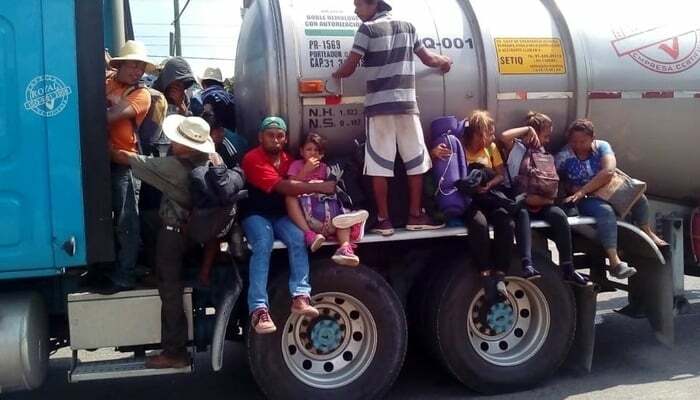 Recruiting people into the caravan would not seem a hard sell considering the living conditions in Central America. Other voices have claimed third-party sources funded this caravan to spite the Trump Administration. One name that comes up is that of billionaire investor George Soros. This has been discredited by the media and labelled a conspiracy theory although it hasn’t stopped Donald Trump from alluding to it. Still, questions arise about the speed with which the caravan has moved. Some pictures have circulated depicting alleged organizers giving money and food to immigrants. Also, many migrants have posed for pictures with their country’s flags in a display of nationalism. Regardless of the rumors, the reality is that inequality plagues Central America, where the gap separating the haves from the have-nots is widening. This will not be the last caravan. In fact, another caravan is soon to leave from El Salvador. This is a clear sign that the situation is desperate enough for people to leave, literally, with the clothes on their back. The ball is now in the Trump Administration’s court. What effect the results of the mid-term elections will have on this phenomenon is unclear. What is true is that the migrants will meet a rude welcome when trying to enter the US. No doubt they will face strong resistance. Whatever the outcome, the Trump Administration needs to remain a steady partner to Central America despite the region’s instability, corruption and alarming crime rate, and not roll back Obama’s Alliance For Prosperity.